Underground has finally delivered on its promising premise. “Firefly” is a tense, action-packed hour of television, replete with acts of love, acts of war, and a far-fetched escape plan. It’s easily the best episode of the season so far. We open at the Macon plantation, the morning after Rosalee and Noah fled. Cato goes to Bill the overseer’s quarters to wake him up. He finds his body splayed on the floor, a broken bottle stuck into his neck. As Cato approaches, Bill gurgles. He leans down to end the man’s misery — and presumably, to prevent him from naming any names — when another overseer shouts from outside. Cato reluctantly calls back for help. In the house, Ernestine is newly aware of Rosalee’s absence. She tries to remain calm, but when she’s called to help stitch up Bill, the truth comes out. Tom has assumed that Noah was the attacker, but Bill whispers Rosalee’s name. Ernestine looks nauseous. Henry is certain that Noah is waiting just beyond the plantation for them to catch up. He tells Sam they should run tonight. Sam thinks that’s a bad idea; they’ve surely fled farther by now, and the plantation is locked down. At the Pullman residence, Ben asks Jay if he taught August how to track and hunt, then asks, “You know what he does with it now?” (And suddenly, I’m a fan of Jay.) While that conversation happens, August attends a parent-teacher conference. Apparently, Ben’s been acting out. August is offended and suggests he’ll just pull Ben out of school. Outside, he tells Jay that it’s time Ben learned a trade: slave-catching. No! This sequence didn’t really sit well with me. It’s framed like a standard-issue home-invasion story, with John and Elizabeth bound and panting in fear. Are they rethinking their commitment to the cause? How will this affect their abolitionist sympathies? It’s a discomfiting tone. Thankfully, that tone develops into something more complex. Josey’s actions are cruel and irrational, but “Firefly” won’t let us forget that he’s responding to something even more cruel. Ernestine pays a visit to Sam, ostensibly to pick up a mobile for the unborn Macon child’s nursery. She’s actually there to demand more details about Noah’s plan, and they end up bickering. Sam resents her questions — “I’m glad you finally got a use for me,” he quips — and Ernestine can’t believe that he’d dredge up his abandonment issues. In the end, she gets him to spill the beans. Next, we get to see Noah and Rosalee! They’re hiding in a cabin near the plantation. Noah suggests finding new clothes; they need to throw the dogs off their scent. Rosalee doesn’t want to be left alone, so he reassures her by coming up with a secret whistling signal. She’s still terrified, of course. Who can blame her? Back on the plantation, Ernestine is hanging the mobile when Suzanna barges in with an interior designer. They’re bickering about fabric for the nursery. The designer says that the expensive stuff will take six weeks to ship by post, and Ernestine suggests a train could deliver it faster. The designer reveals that a train is leaving Atlanta tomorrow, which causes Ernestine to perk up before she leaves the room — perhaps Rosalee will be on that train. Once she’s alone, Suzanna admires Sam’s handiwork. It’s yet another nuanced scene, which emphasizes Ernestine and Sam’s brains and talent. Compared to their plight, the Macons’ concerns are trivial. Down in the cellar, Tom offers Cato the position as overseer. We learn that Cato has worked for Tom for 11 years. Over a shared drink, Tom says he trusts Cato and hands him a whip. As he leaves, he “generously” tells Cato to pick a bottle of liquor for himself. “I’m sure you’ll earn it,” he says. Cato quickly puts on a show in his new role. “Y’all picked 3,000 pounds under Bill. I intend to double that,” he says. Pearly Mae and Moses are worried about the forged freedom papers, which are missing. Did Cato take them? What’s his plan? Back in the cabin, Rosalee is washing up when she hears Noah whistle. He’s brought her a dress. Rosalee asks Noah to help with the buttons, and he sees the wounds on her neck. His hands linger until they hear dogs rushing toward the cabin. August and Ben arrive on the plantation to meet with Tom. He says he’ll only hire August if his own men fail. We then see Noah and Rosalee running through swamp water. Noah says he’ll stay and distract the catchers. Rosalee again protests; she doesn’t want to be left alone. Noah reminds her that she was strong enough to fight Bill and run for freedom, so she’s strong enough to fend for herself until he returns. It’s pretty much the most romantic pep talk ever — and it works. Thinking quickly, Rosalee picks wild flowers to poison the dogs. “This the good wine?” Josey asks as Elizabeth serves him. Elizabeth smiles and makes eye contact; it’s her favorite. Josey barks that slaves don’t look at their masters. He deliberately knocks the wine over, then demands that Elizabeth clean it up. Josey still thinks John is lying, and threatens to show him what happens when slaves lie. Wash tries to reason with his partner, but he ignores him and orders Elizabeth to whip John. Wash storms out as the whipping begins. It turns out Josey was right. In his first year as a lawyer, he oversold an estate … and Josey’s wife was part of the sale. She was shipped off to a tobacco plantation in Kentucky. Josey is teary, but almost relieved: “Tobacco ain’t as back-breakin’ as pickin’ cotton.” It’s a heartbreaking scene to watch, and Smollett really plays the hell out of his role. When John makes up a story about his wife — he claims she was shivering in the sale wagon, but she was actually sold in the summertime — Josey suffers another bout of rage. He stabs John, then Wash returns and knocks him out cold. Just as Wash apologizes for leaving, he’s shot dead by the sheriff. John and Elizabeth need a cover story, so they claim it was a botched robbery. As night falls, Noah and Rosalee move to another cabin. He wants her to decode more of the spiritual. When she asks what the rush is, he reveals he’s going back for the others. She protests, but then he tells her why: When he was Henry’s age, he first heard about free black folks and it ignited something within him. At his old plantation, he was whipped for “acting like he was free,” then decided to simply play the good slave — until he met Henry at Macon. He has to go back for him. Rosalee is so moved that she kisses him. “You come back,” she says. All Noah can do is nod. As Tom and the slaves try to douse the flames, August points out it was arson. Tom hires him on the spot to find the missing slaves, and the catchers are quickly on the trail. Even though Zeke seems to be the slowest one, Pearly Mae decides to sacrifice herself so they can keep going. (It should’ve been Zeke. How far can he get if he runs like that?!) She tells Moses to do whatever it takes to get their daughter free. 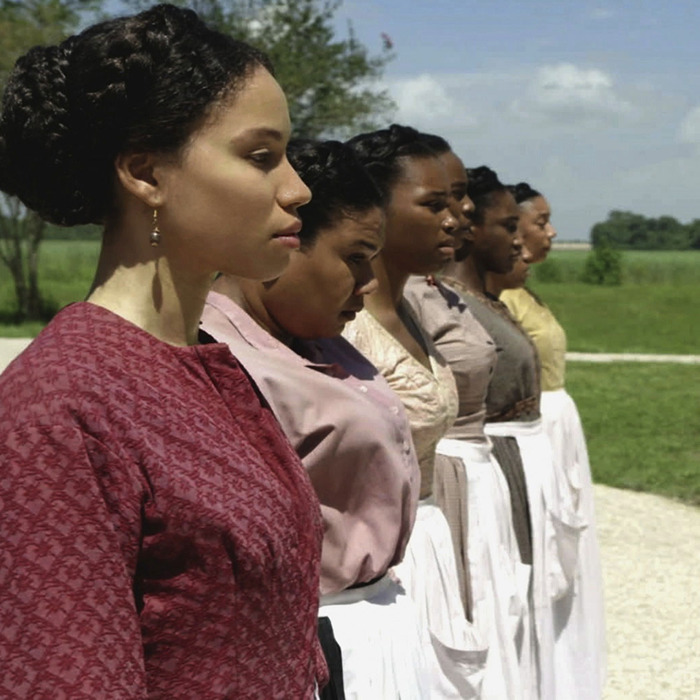 As she’s dragged back to the plantation, Sam casts a sorrowful look her way. Will they devise their own escape plan? I hope so. Alone in her hideout, Rosalee sees a swarm of fireflies. She steps out into the glowing mist, then hears Noah’s whistle. The crew suddenly appears, calling to mind an assembly of superheroes. Rosalee smiles as she asks about Pearly Mae and Sam. She’s met with silence. Back at the plantation, Ernestine stands apart from the people throwing water onto the blaze. She hugs herself, her face a mask of anguish. As she makes eye contact with Tom, he shoots back an inscrutable look. Will she beg him not to let their daughter go? Would he ever agree? We don’t know yet, but one thing is for sure: Underground has become a must-see series.